In these times of excess, the Japanese designer Masaki Matsushima envisioned an all white world of purity and calm evoked by the soothing scent of grapefruit, vetyver, musk, white tea, and rosemary accord. M; Men embodies this vision - a fragrance that's always present, but never overwhelming. Other notes include bergamot, lemon, bamboo sap, lotus flower and nutmeg. 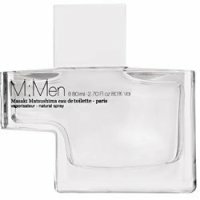 M; Men is available in Eau de Toilette and Deodorant Stick.